I thought it was about time I wrote up this tutorial that I had taken pictures for over a year ago. I have made dozens of these blankets, and my kids have been dragging them around for years. 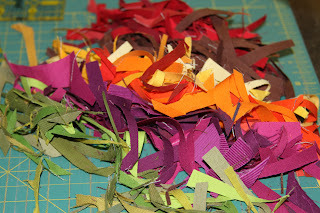 While this receiving blanket is not uncommon, I have a little more relaxed way of making it. 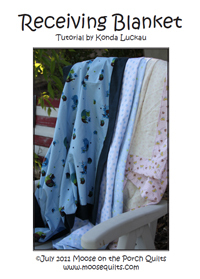 The most common way to make these receiving blankets is using flannel for both the top and bottom. 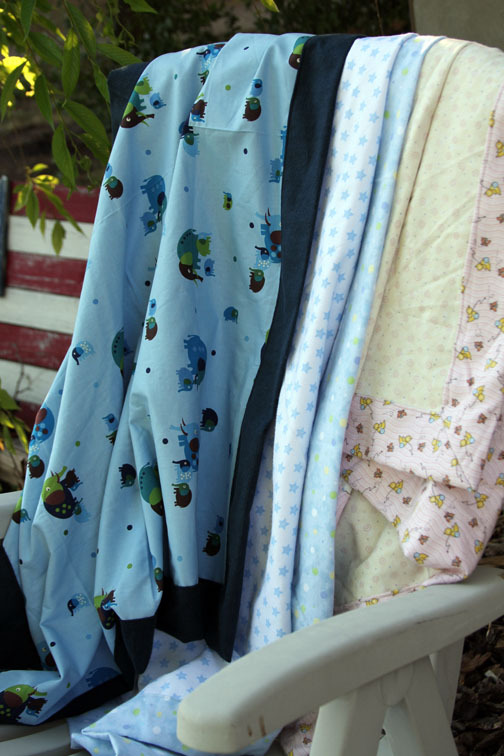 I have also made them using a non-flannel for the top and a flannel for the bottom like the blue elephant blanket below. Also, for a light weight, summer blanket, I have made them using a non-flannel fabric for both the top and bottom. It's a little tricky, but I have also made them about fat quarter size with a silky feeling fabric. My kids love these "silkies!" It's also in the tutorial list on the right. 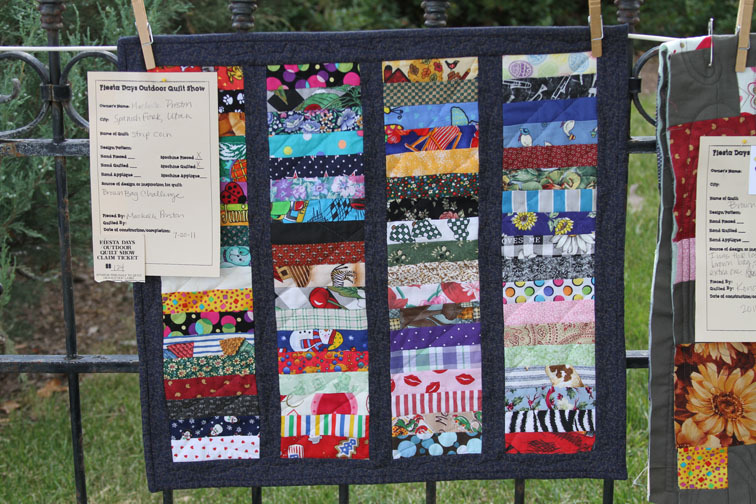 This year's brown bag challenge quilts were few in number, but worth showing nonetheless! One of you asked me to show you the contents of my bag. What a great idea! I am use to not being able to show my projects until months after they are finished, so I didn't even think about showing pre-quilt pictures. I will tuck that information away and try to remember to share when I can. 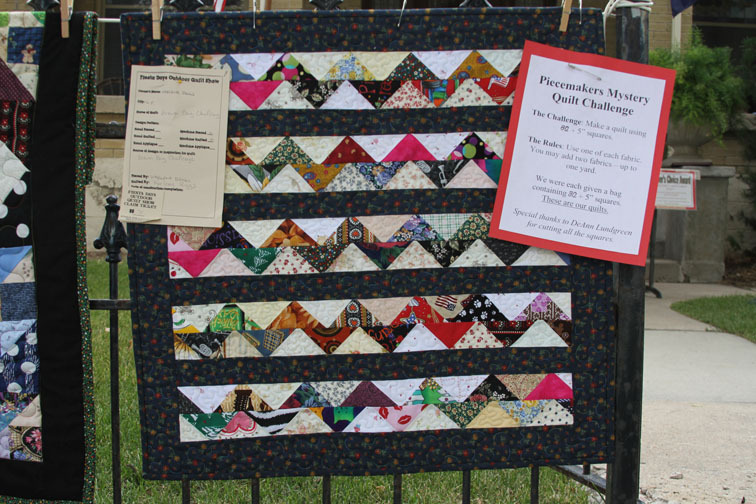 This quilt was my favorite -- even though it's only a top. Brown bag challenges are allowed to be just tops. These half square triangles were about 1 1/2" finished. This is my quilt. It isn't bound. 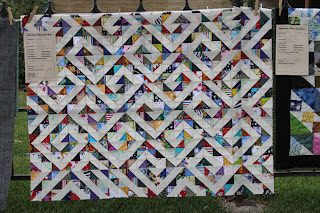 I figure if the top can be unquilted, it can be unbound. It didn't turn out quite like I thought, but it's growing on me. This one was a mini -- about 15" square. Even though only 6 of us did the challenge this year -- we usually have 12 - 20 -- this is still one of my favorite guild activities! This morning I got up at the crack of dawn to help hang a one day outdoor quilt show. I am not really a morning person, but I think I would have enjoyed the sunrise more had I not gone to bed 5 hours before the alarm rang. One of my guilds in in charge of this show, the Spanish Fork Fiesta Days Quilt Show. 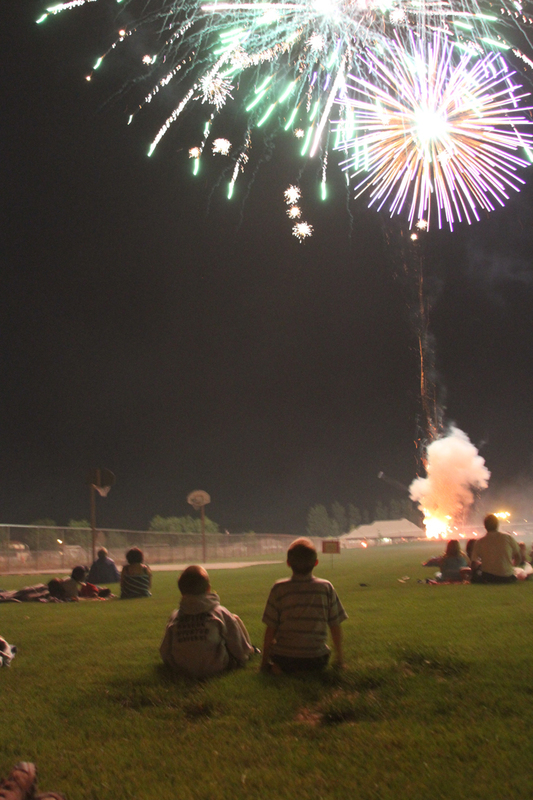 It is always on the 24th of July -- except when the 24th is a Sunday, and then it's on Monday. In Utah, the 24th is Pioneer Day and when Spanish Fork has their annual city celebration. 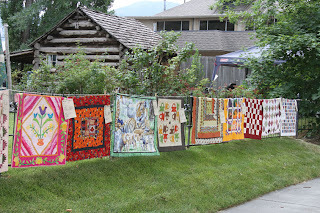 This year there were 125 quilts in the show. 26 of them were mine. A few of those were pieced by others. All of them were made since the show last year. 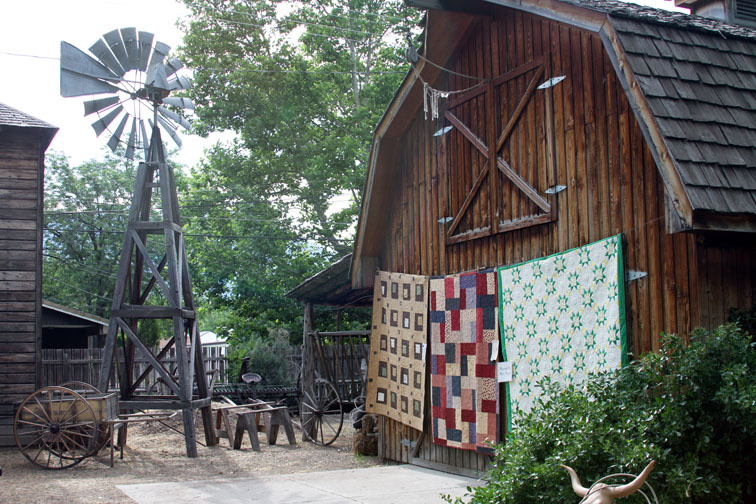 The show is hung at a historic pioneer home on Main Street. Here are a few pictures. This is the front fence. I have one quilt here with the yellow orange border. I love this old barn! 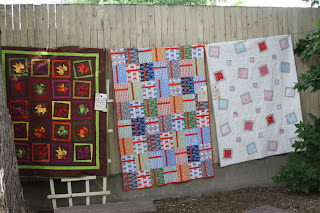 The quilt on the far left is Moon Spots from Simpl y Charming Modern. This was my favorite location. I love hollyhocks! Even when they aren't in bloom. This is also from Simply Charming Modern. This quilt isn't mine. It was made by a friend of mine from my book Simply Charming Collection. 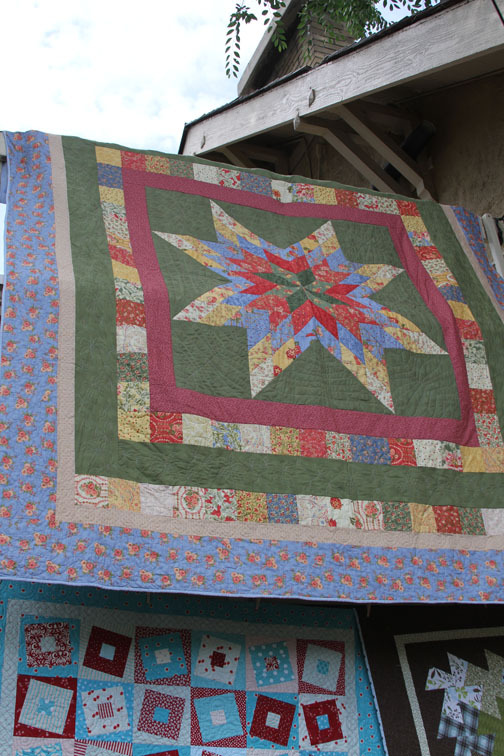 She has made 8 of my Charming Lonestar quilts -- one for each child! 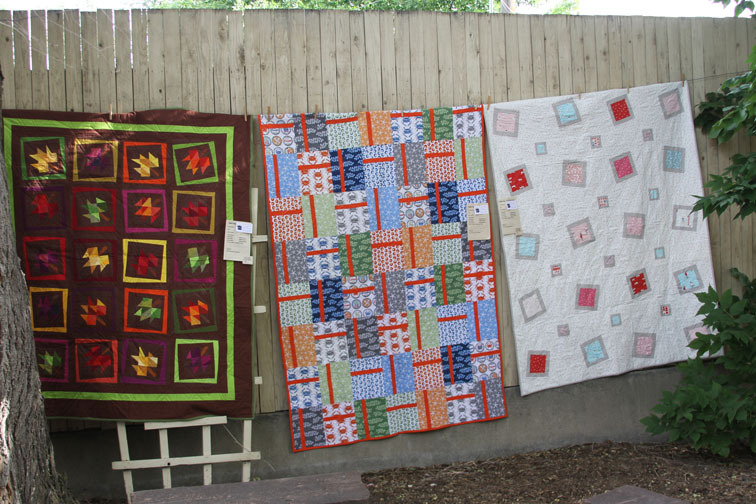 These three quilts are mine. One is a sneek peek that I get to share soon. 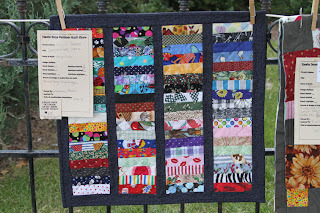 I also have pictures of the brown bag challenge quilts! 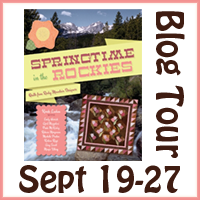 Stay tuned. . . .
What do princess and race cars, Christmas and Easter, music and dogs have in common? They are all fabrics that came in a little brown bag. 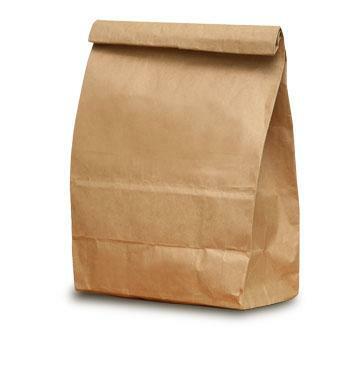 One of my guilds has a brown bag challenge every year. I love it! One of the ladies came up with the idea, and she has been in charge every year since. She cuts a gazillion 5" squares (this year they are 5 1/2" for some reason) and gives each of us a brown bag full of squares. There are usually around 75-ish. 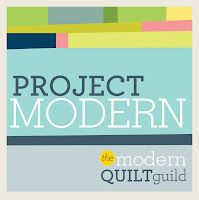 Our guild show is Monday, and we always have at least a dozen brown bag quilts there. That's why I have been busy sewing mine up today. I made the mistake of taking an extra bag this year. I was the last one to get it, and there was an extra. My thinking was that I could make it bigger for a QOV. I should have stopped at the make it bigger part. 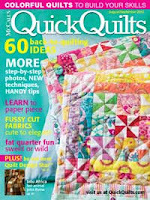 Today I found Fon's and Porter's new issue of Easy Quilts. 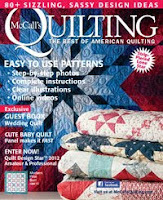 My friend, Machelle Preston, designed one of the quilts in it! Her quilts is called Stars and Stripes. It was designed as a Quilts of Valor quilt. 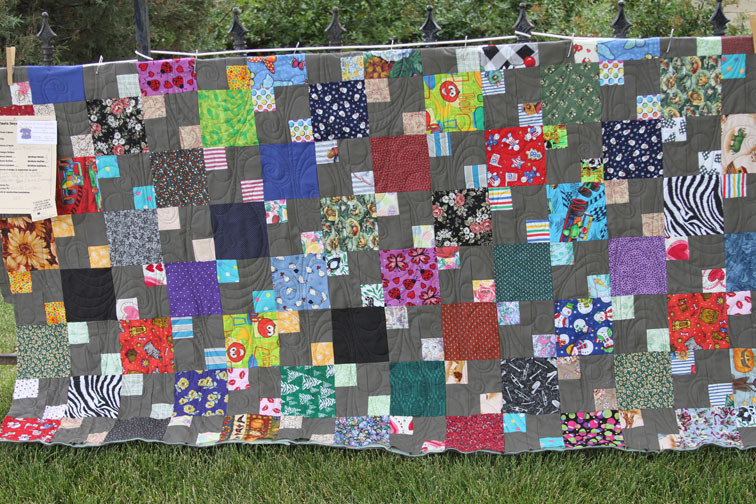 I quilted it. 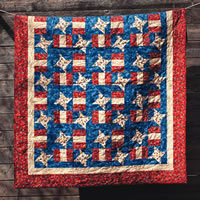 I designed the quilt pattern just for Quilts of Valor quilts. Had a great day today at a local quilt show! My website has finally been updated! It has been a long time coming. The problem with being able to redo the website myself is that I have trouble letting someone else do it. 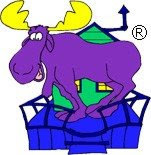 Finally spent some quality time with my sad dejected site: www.moosequilts.com! 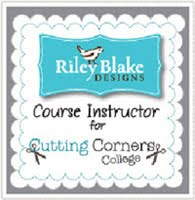 Now my newest books and patterns are available online! 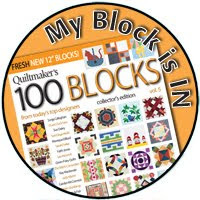 Now, if you are interested, you can buy them online or ask for them at your local quilt shop! 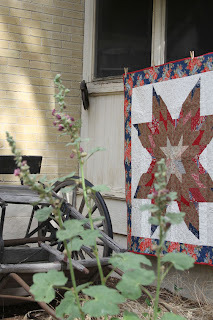 I am getting antsy to show you the quilt. Soon. . . . If you happen to be in the Denver, Colorado area between now and the end of September, you just might want to say hello to my quilt. 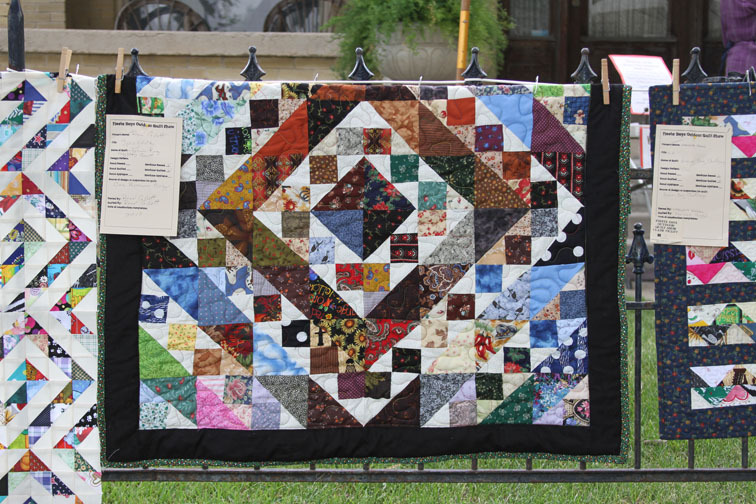 There isn't a picture of my quilt in those pictures. 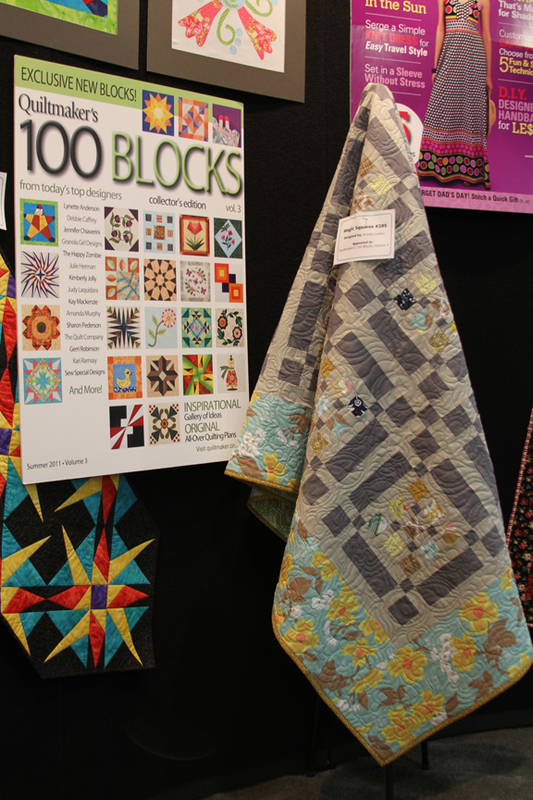 This is a picture of my quilt in Quiltmaker's booth at Spring Market. Speaking of names, I don't remember what they named this one. Okay, I looked it up. It's called Magic Squares. Fun to hear that I'm not the only one so uncreative in naming things. I'd love to hear if you get a chance to tell my quilt hello! I am not a namer. My mother and sister are namers. I remember the name of two of our family vehicles -- Bertha and Mirabelle. I don't remember which vehicles they refer to however. 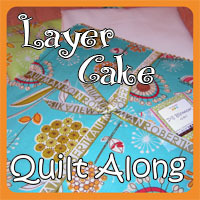 I know a lot of quilters are namers. They have names for their sewing machine(s) or their quilt machine. Naming my children was rough. Often the names I had picked out for them before we went to the hospital was not what we ended up with. I made sure they had names before we left the hospital because I realize that it important for a child to have a name, and if we waited until we got the child home, well, that just meant more paperwork. 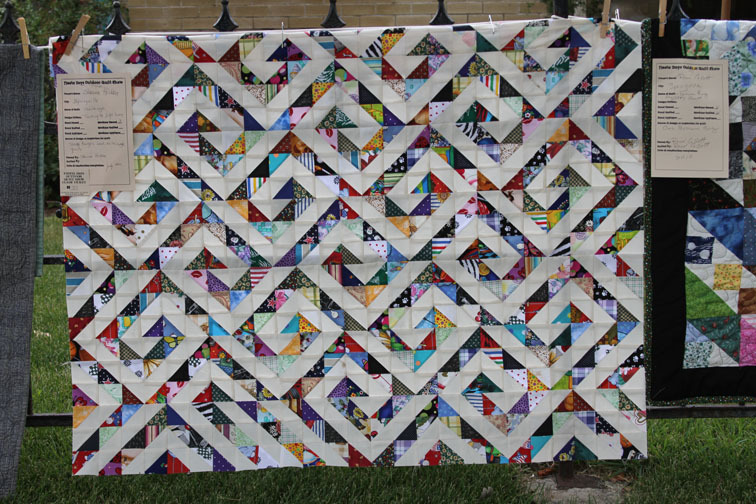 Quilts, on the other hand, I don't know why they need a name. 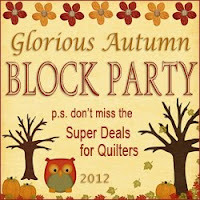 Unless, of course, I am creating the quilt and sharing the pattern. I have a real problem with this. 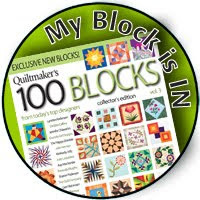 Quilts talk to me in so many ways, but I sometimes I feel like I haven't been properly introduced because they haven't told me their name. 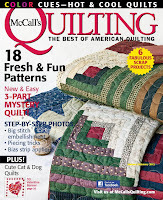 In fact, the quilts I send to magazines, I usually let the magazines name them. One quilt I made recently I named Wonky Autumn Leaves. It will be coming out in Fat Quarterly. I will share more about that one soon. I changed up a few things as I went along because the quilt told me it needed something different than I had in mind. 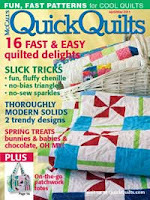 I feel like I might have just found the quilts nickname. I was only mostly okay with that name. I felt like their was a better one, but with a deadline looming, I just had to go with Wonky Autumn Leaves. Hope she likes it! One other quilt that I just quilted yesterday, I can't even begin to think of a name. 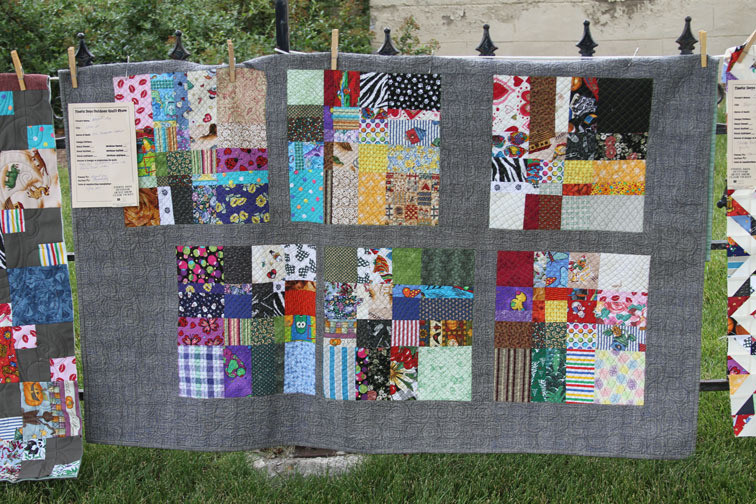 I went through a creative process with this quilt, and it turned out nothing like I started. 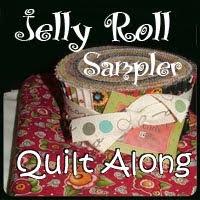 I really enjoyed making it, and I just want the quilt to introduce herself to me! 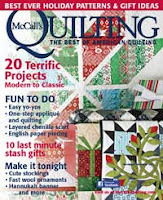 But, since this one is going to McCall's Quilting, I am sure I will ship her off and wait until the magazine comes out to be formerly introduced. 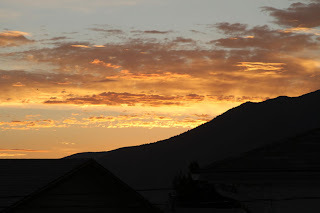 So -- are you a namer? What's the name of your sewing machine? 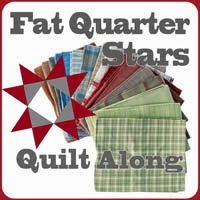 Any suggestions on naming quilts? I have a feeling I'm hopeless.